We had this for dinner recently. I don't really know where the recipe came from in the first place. It's one I have typed up in my recipe book, and I've had it for a while. Begin heating pasta water. Meanwhile, heat oil in large skillet over medium heat; add chicken. Cook, stirring until chicken is almost cooked through. Add carrot to skillet and cook for a couple minutes, then add garlic and broccoli and cook 2 to 3 minutes longer, or until vegetables are crisp tender and chicken is thoroughly cooked. Cook pasta according to package directions. Add chicken broth, basil, and Parmesan to skillet. Stir to combine, reduce heat, and simmer while pasta cooks. Before draining pasta, add a ladle of your pasta water to the skillet and set aside 2 or 3 ladles for later. 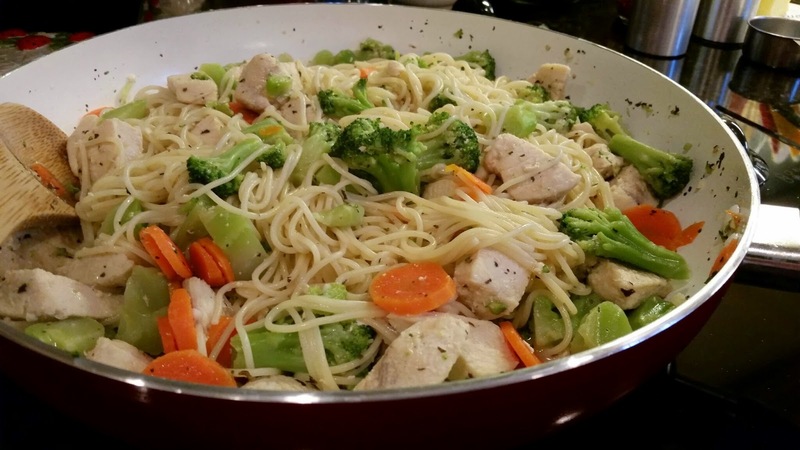 Drain pasta and add drained pasta to chicken and vegetable mixture in the skillet. Stir to combine and heat for a few minutes on low. Serve with additional Parmesan and fresh ground black pepper. -- add your reserved pasta water to any leftovers before refrigerating. I really should make this more often. It's quite simple to make and very good. There are only 2 of us, so we had leftovers, and we enjoyed those, too!